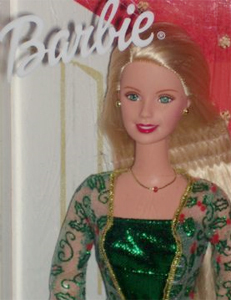 2003 Holiday Joy Barbie is a glamorous Christmas Barbie dressed in a festive long green sparkly dress with a long-sleeved, sheer long jacket with red and green holly leaf embellishments. She also has a necklace and earrings. Barbie comes with a plastic, clear snowflake ornament with gold glitter (for you). She has long blonde hair with green eyes. She was also made in an African American edition. "The joy of the season surrounds us all -- whether it is the joy found in the beauty of a smile or the warmth of a family gathering. Celebrate and share the joy with Barbie!" and Mattel and Entertainment Industry Foundation(EIF) are working together in the U.S. to raise awareness for arts education for children.